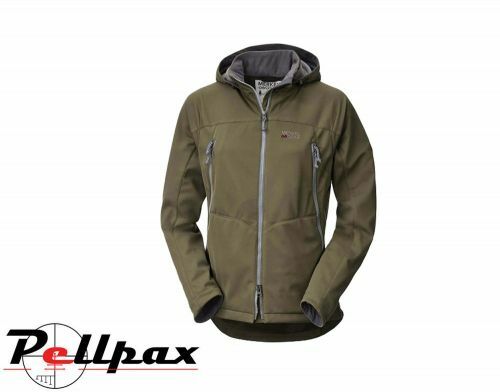 The Palearctic 365 Jacket from Merkel Gear is a lightweight and 100% windproof jacket. It has been designed for the demanding all-year-round use for all weather conditions.The smooth 3-layer-laminate with integrated 37.5TM-membrane provides extra protection against the worst weather conditions, damp weather and minus degree cold weather. The inside insulation is made from a Waffle-fleece-backing that warms you whilst simultaneously directs excess heat away from the body due to its special microstructure. The jacket has a close-fitting cut that doesn't eliminate full range of movement, the back is significantly longer for protection against wind. The perfectly cut sleeves that provide protection against any unwanted drafts. The jacket has a DWR-finish so that the water will just bead up on the surface and drip off. Additionally there is a drop-away-hood which can be tucked away when not needed.There is a full front extra-large ventilation zip. There are two larger outer pockets and two upper pockets that are to be used as hand-warmer pockets. There is a built in elastic band that will prevent your optics from swinging about when you're out and about. The lower pockets are lined with soft loop-fabric, which allows you to easily attach the provided cartridge-patches. Add this item to your basket & spend an extra £229.01 to apply for finance.